His mission – completely voluntary – is to watch over the tallest birds in North America, the whooping cranes, which nest in the area after a 2,500-mile summer migration from Texas. Photo by Photo: Klaus Nigge – An elegant whooping crane swoops across a wetland. “They’re my passion and I want to help protect them. You can’t see this anywhere else,” said Schaefer, a town bylaw officer and Salt River First Nation councillor. Canada is home to the world’s largest migratory population of whooping cranes. According to Environment Canada, there are almost 300 birds in the Wood Buffalo flock – the only self-sustaining, wild flock on earth. Whooping cranes were designated as endangered in Canada in the year 2000. It was estimated by the Whooping Crane Conservation Association that only 16 whooping cranes were left on the entire planet in 1941-1942. Schaefer has named the two young cranes he’s been keeping an eye on Snowball and Snowflake, who he thinks are descendents of the original “Lobstick pair,” which still nest further down on the Foxholes prairie land. Photo: Renee Francoeur – Ronnie Schaefer of Fort Smith takes a closer peek at Snowball and Snowflake. Many cranes make their nests in the traditional breeding grounds in the northeastern corner of Wood Buffalo National Park. Their nests are counted every year for a survey by the Canadian Wildlife Service, undertaken in partnership with Environment Canada and Parks Canada.This year, 74 nests were counted, according to Mark Bidwell, a species at risk biologist with Environment Canada. That number is one less than the record set in 2011 at 75. Bidwell estimates about 150 birds are breeding out of the 300 in the flock. As well, Bidwell noted, the population continues to expand outside the park. Eight nests were discovered outside Wood Buffalo’s perimeters this year – one more than ever recorded. Additionally, breeding pairs, known to go back to the same nest year after year, are making nests in new locations, never before monitored by surveyists. Four to six new nests were recorded this year. More possibilities of human interaction with the cranes also worries Schaefer. Sonia Trudeau, who went out with Schaefer to see the cranes last month, said she cried when she saw the eggs. The Canadian Wildlife Service will return to the Fort Smith area in August to do a follow up survey on the nesting success and chick productivity. Meanwhile, Schaefer said he plans to keep a close eye on Snowflake and Snowball’s rusty-brown coloured chick, who just hatched last week. “They know me. I can read them. I know when to back off when they’re in protective mode. I think they know I’m looking out for them,” he said. 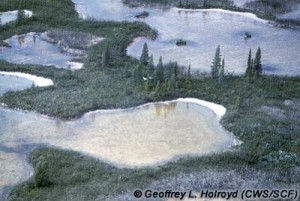 A Canadian citizen whooping crane observer told the Whooping Crane Conservation Association that 74 nests have been counted in Wood Buffalo National Park this year (2013). Some of the nest have already hatched and the whooping crane parents are making their unison calls as shown in the photograph. The Association is hoping for a very successful reproduction this year. 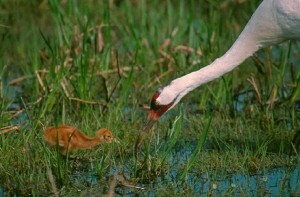 Note the young whooping crane chick in the photograph. Photo: ENR NWT – The fire on top of Salt Mountain approximately 30 km west of Fort Smith grows to 1,100 hectares on Wednesday evening due to a cold cell and gusting winds that sent embers across the highway out of Wood Buffalo National Park. For the second time in less than 11 months, a major campaign fire on Salt Mountain within 35 km of Fort Smith brought that community to a high state of alert, followed by relief after it was expertly controlled. 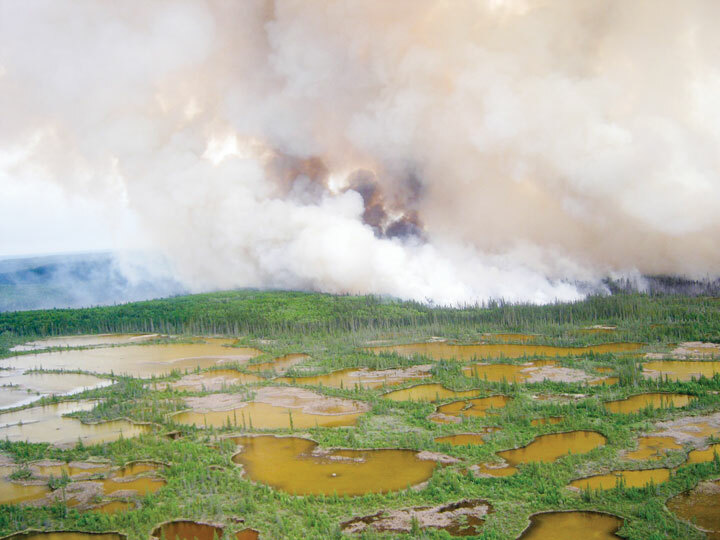 Last summer in late July, a multi-jurisdictional fire that started in Wood Buffalo National Park involved Alberta, NWT and national park resources in a campaign fire pushed by wind. Fire crews managed to corral it just as it threatened to cross Hwy 5 and take out the power lines from Taltson Dam that serve Fort Resolution, Enterprise and Hay River and potentially even turn towards Fort Smith. The fire was contained right at the highway with textbook-like precision. The current fire started June 1 due to lightning in the park, burning slightly southwest of the 2012 burn, just south of Hwy 5. Over several days, Parks Canada crews from Wood Buffalo and three other national parks worked the fire on the ground, assisted by choppers with buckets and tankers of retardant from Alberta and the NWT. On the night of June 3, the fire grew dramatically overnight. Crews performed a successful burnout operation along the highway to clean out fuels it might feed on if it turned that way to cut off the road and even burn the power lines. It was well contained and under control at that point. Mother Nature decided to trump all that, however. On June 5, the weather changed and a cold front moved in, generating high winds from the south. By the afternoon, the fire had jumped the highway. 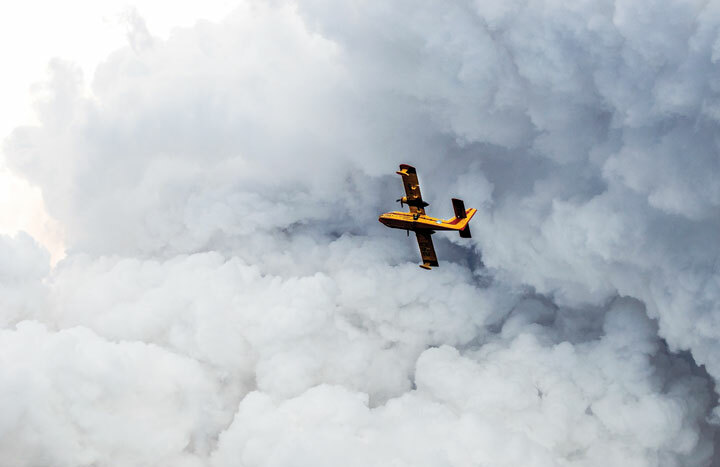 Photo: Patrick Pennycook – A GNWT water bomber heads through a thick cloud of smoke during control efforts on Wednesday evening. “A spot inside the fire flared up and embers travelled across Hwy 5,” commented Jean Morin, fire program manager for Wood Buffalo National Park. He said the embers flew nearly a kilometre from well inside the fire, over the burnout, and started a new fire on the north side of the highway. It moved quickly. “With the wind, the spread of the fire was very fast,” Morin said. He said they bucketed the fire with the Parks Canada choppers and the NWT government called in air tankers to lay down retardant. The fire got into pine and spruce forest along the road to the Foxholes Prairies, producing a massive smoke column in the afternoon sky. The fire then became an NWT challenge and crews from Fort Providence, Fort Liard, Inuvik and Hay River joined Fort Smith crews on the ground and hit it hard. Retardant lines were laid down by air tankers to protect the nearby settlement of Salt River. Five bulldozers were contracted to create a fire guard that protected both Salt River and the Foxholes Prairies where several pair of whooping cranes nest. In the middle of the rampaging wildfire was an encampment of heavy equipment belonging to Aurora College, sitting in a gravel quarry near the Foxholes road where the college runs on-site training for a Thebacha Campus Heavy Equipment Operator course. College staff were forced to abandon the work site as soon as news came of the fast moving fire. There was fear all that expensive equipment might be lost. Fortunately, all equipment survived unscathed. The Caterpillar tractors, loader and excavator were parked in the centre of a large gravel pit and the fire burned around and past it. Cool weather subsequently helped the firefighters’ cause and with rain June 6, the blaze, after six action-packed days, was finally brought under control. Expansion of hunting opportunities in the Quivira National Wildlife Refuge is being proposed by wildlife officials but faces opposition from birdwatchers who say the recommendation will put at risk the endangered whooping crane. “What has become probably the most significant migratory stop for the whooping crane in Kansas could be substantially less accommodating for whooping cranes in the future,” said Ron Klataske, executive director of Audubon of Kansas. 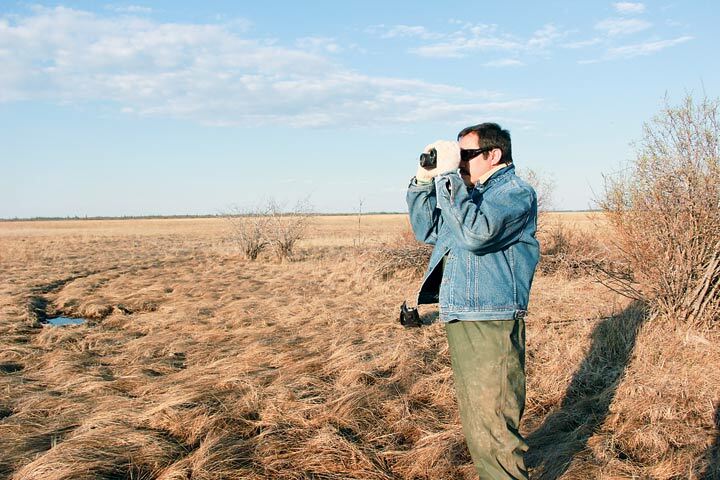 But Mike Oldham, manager of the Quivira National Wildlife Refuge in south-central Kansas, says he believes expanding access to hunting can be done while ensuring the safety of whooping cranes, a federally endangered species that is illegal to shoot. “We carefully considered the risks to the federally endangered whooping cranes that migrate through during the hunting season when considering the expanded access,” Oldham said. For the whooping crane, the tallest bird in North America and one of the rarest, the Quivira National Wildlife Refuge is a welcome sight. Brought to the edge of extinction in the 1940s, there are about 600 whooping cranes remaining in the world. The only self-sustaining flock, numbering about 270, migrates in the fall from the Wood Buffalo National Park in Alberta, Canada, to the Aransas National Wildlife Refuge on the Texas Gulf Coast. In the spring, it returns to Canada to breed. That’s a 5,000-mile arduous and sometimes dangerous journey. The 22,135-acre refuge in Kansas is a safe stopover where the birds, some as tall as 5 feet with a wing span exceeding 7 feet, can rest and eat. Currently, if “whoopers” are present at the refuge, hunting for other animals, such as ducks, geese and pheasant, is closed to avoid disturbing the whoopers and prevent accidentally shooting them. 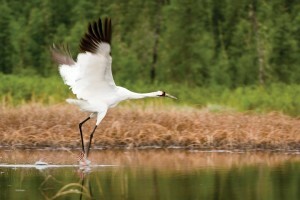 This spring produced the second highest number of confirmed sightings of whooping cranes at 75, according to the U.S. Fish and Wildlife Service. 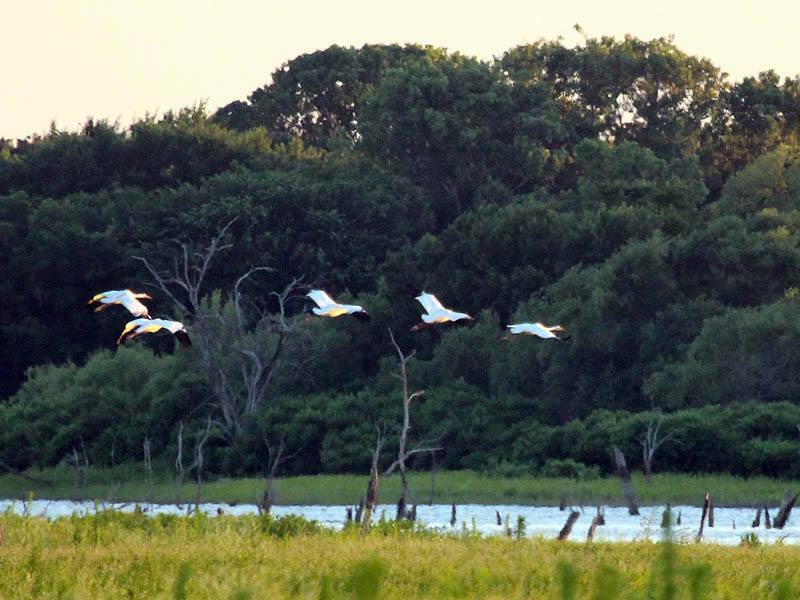 And last fall, 73 whooping cranes visited the refuge, which is about 240 miles west and south of Lawrence. The closures due to Whoopers has resulted in some disappointed hunters, officials say. “Whooping crane arrivals and departures are unpredictable, which makes it difficult for hunters to plan ahead. Public lands for hunting in Kansas are also limited, which exacerbates their frustration,” according to a draft conservation plan for the refuge that has been put forward by the U.S. Fish and Wildlife Service. The 263-page document and the public comment it has generated are under review. Klataske said the refuge should be going in the opposite direction from the recommendation and just shut down hunting entirely during the periods when whoopers are known be around. “These whooping crane need places where they can go to rest, recuperate and recharge for the remainder of their migrations,” Klataske said. He said the draft proposal changes the purpose of the refuge, making it more of a hunting area. “It will not be as attractive for people to come throughout the country to view birds and other wildlife. It is probably the best wildlife viewing destination that we have in the state of Kansas,” he said. But officials with the Kansas Department of Wildlife, Parks and Tourism support the federal agency’s recommendation, saying there is a need for more places to hunt. The Fish and Wildlife agency says it hopes to approve a final plan by the end of the year. Latest report from Texas Whooper Watch regarding the two Louisiana Whooping Cranes that have been spending the past few weeks at a lake in Wise County Lake, Texas. After their long 2,500 mile migration, most whooping cranes have reached their Wood Buffalo National Park (WBNP) nesting grounds. Most of those that arrived early are already nesting and others will be soon. Hopefully they will have a successful hatch this year and raise the population above the 300 level. A few of the mostly sub-adult whoopers are still arriving at Wood Buffalo. They can take their time because they are not involved in building nests, incubating eggs and raising the next generation. Once the adult cranes settle in and re-establish their territories they begin nest construction, which usually takes a couple of days. Generally 2 eggs are laid about 2 days apart. Incubation begins with the laying of the first egg and it usually takes about 30 days before hatching. Whooping Crane breeding territories are in the extreme north-eastern corner of WBNP. The park itself covers 11 million acres (44,000 sqkm) while the breeding area is contained within a 1.5 million acres (80 x 80 km area). The nesting area lies among the large marshes adjacent to the Sass, Klewi, Nyarling and Little Buffalo rivers. Each nesting territory is a mosaic of small to large shallow wetlands with bulrush, sedge and cattail as the dominant emergent vegetation. In among the wetlands are low ridges and upland areas dominated by black spruce, willow and dwarf birch. 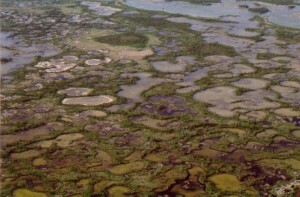 The photo shows typical whooping Crane wetland nesting area in Wood Buffalo National Park, Canada. 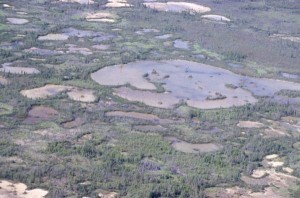 Note the numerous shallow wetland ponds. How many whoopers will be nesting this year? No one knows. We will have wait for the “official” information until late October 2013 when the Canadian Wildlife Service advised they will issue their next report. Currently we are depending on information that we get from interested private citizens. To get some idea about nesting efforts we must check data from last year (2012). 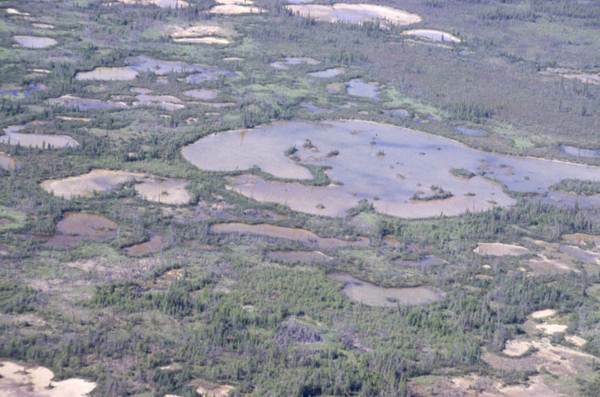 In May 2012 sixty seven (67) whooping crane nests were discovered by the Canadian Wildlife Service. Three months later in August, an additional three (3) familygroups were identified indicating that there were at least sixty-nine (69) nesting attempts during the 2012 nesting season. In early August, just prior to fledging, thirty-four (34) young were observed on the breeding grounds. Two (2) sets of twins were observed. Ten of the young whooping cranes were marked with leg bands and satellite transmitters. Of the 67 nests detected in 2012, five were in new territories (all within WBNP) and five were outside of the national park (two in the Lobstick Creek area, and three north of the Nyarling river). Based on the 2012 data and average whooping crane population increases the Whooping Crane Conservation Association projects 75 nests in 2013. During 2012, habitat conditions on Aransas National Wildlife Refuge were below average but the resourceful whoopers appeared to be in good condition as they began the migration to Canada. When the whooping cranes arrive on the nesting grounds in good condition, nesting success is usually good. Hatching usually takes place during the first 2 weeks of June. Both photos in this article were taken by Brian Johns, President, Whooping Crane Conservation Association. 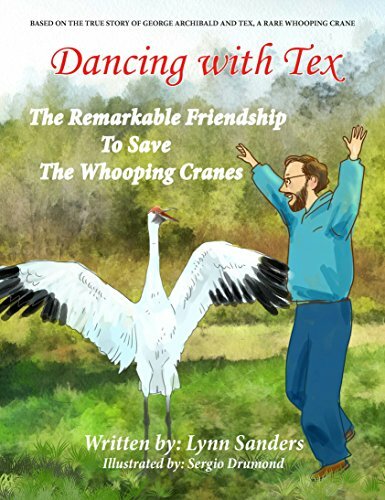 The Aransas/Wood Buffalo whooping crane flock is well on its way to Canada’s nesting grounds. Approximately 285 whoopers are involved in the 2,500 mile migration. Traveling in small groups the whoopers are expected to begin arriving at the Wood Buffalo National Park nesting grounds in Canada soon according to the Whooping Crane Conservation Association. Dr. Wade Harrell, U.S. Whooping Crane Recovery Coordinator advised that most of the whoopers have departed from their wintering grounds at Aransas National Wildlife Refuge in Texas. Over 30 are currently being tracked via GPS telemetry so wildlife biologists can monitor their movements and learn more about the areas they visit during migration. By May 5 most of the birds had left the wintering grounds. Some have reached Canada.Three cranes with GPS radios are still in North Dakota as of May 21. 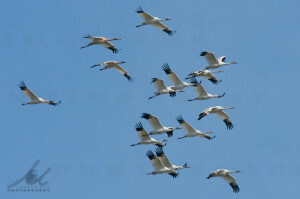 To keep up with the migration click on the following link https://whoopingcrane.com/migration/ . 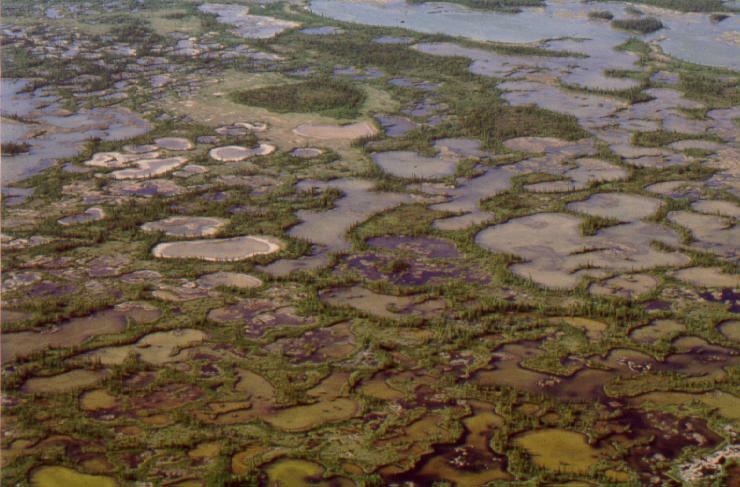 Wood Buffalo whooping crane habitat, Canada. Mark Bidwell, Species at Risk Biologist, Canadian Wildlife Service is currently at Wood Buffalo nesting grounds to begin the spring survey. Conditions on the nesting grounds and arrival of the whooping cranes will be monitored for the next several weeks. A report on Bidwell’s findings during his surveys should be available in the near future. The 2012 whooping crane nesting season was again productive with a high number of nests being discovered and many fledged young observed. Water levels in spring and late summer were adequate and chicks benefited from mild summer conditions. For the third time since 1988, whooping crane chicks were captured and banded in Wood Buffalo National Park (WBNP). Annual precipitation preceding the 2012 breeding season was 14 percent below the 60year average despite above average accumulation in the spring. The majority of spring precipitation fell in the month of March before the arrival of cranes in WBNP. During May, water levels were high in most parts of the breeding range, giving the birds many options for nesting. Rain in July, August, and September maintained water levels and presumably supported an adequate food supply. Area affected by forest fires in WBNP was extensive in 2012. Six percent of the park burned in 2012 (the 25-year average burn area is 1%). Five fires occurred in the whooping crane nesting area, burning 17,312 ha or 4.2% of that area. In May, aerial surveys were conducted to identify whooping crane breeding pairs and nests in and outside of WBNP. 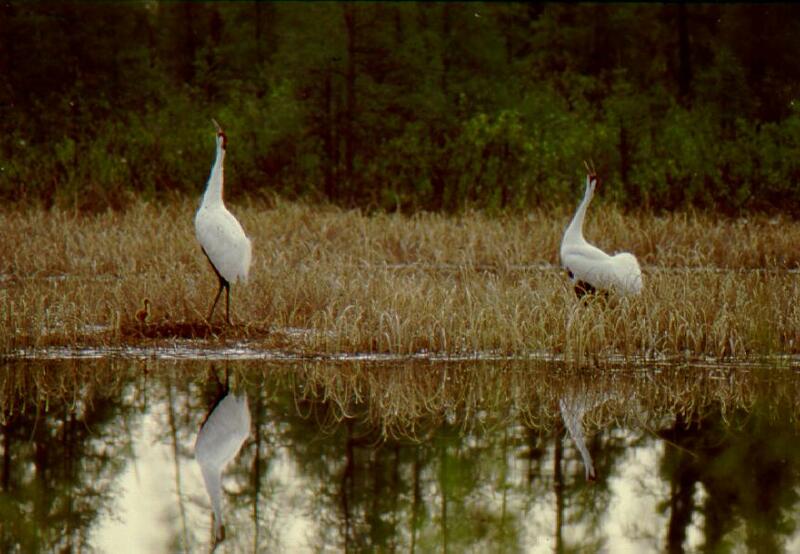 During surveys, 67 pairs of whooping cranes were detected, 66 of these had nests. This number represents the third highest count on record. In addition to nests detected during surveys, three lone birds displaying territorial behaviour were observed but nests were not located for these birds. The single non-nesting territorial pair suggests potential for further population expansion in coming years. Of the 66 nests detected in 2012, five were in new territories (all within WBNP) and five were outside of the national park (two in the Lobstick Creek area, and three north of the Nyarling river). In late July, surveys to determine fledging success of whooping cranes were completed. In total, observers detected 35 fledged young in 33 family groups (31 groups had a single chick, two families had two chicks). Apparent average fledging success was slightly higher (0.53) than the 20-year average (0.48). Actual success may have been higher but smoke from fires during surveys made it difficult or impossible to access several territories in which nests were detected earlier in the year; thus, additional chicks may have fledged but gone undetected. This year marked the third year of a multi-agency research initiative to capture and mark fledged whooping crane chicks in WBNP. Captured birds are fitted with a satellite transmitter with Global Positioning System capabilities mounted on a two-piece leg band. Transmitters are programmed to record the bird’s spatial location four times daily, recording both daytime and nighttime locations; this schedule provides data on diurnal and nocturnal (roosting) habitat use during all stages of the annual cycle, and on migratory behaviour in spring and fall. The marking project, carried out by the Whooping Crane Tracking Partnership (WCTP), represents a cooperative effort between five core partners: the Canadian Wildlife Service, the US Geological Survey, the US Fish and Wildlife Service, the Crane Trust, and the Platte River Recovery Implementation Program (with support from Parks Canada Agency, the International Crane Foundation, and the Gulf Coast Bird Observatory). On 31 July and 01 August, 10 fledged whooping crane chicks were captured and marked with satellite transmitters. Whooping cranes spotted in South Dakota. 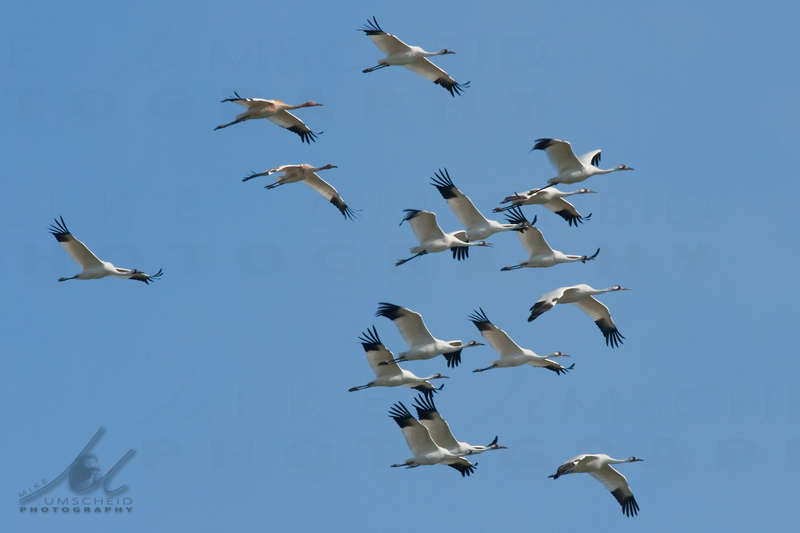 On April 2, a flock of 16 whooping cranes were spotted near the Crow Lake Wind Project in South Dakota. The birds were spotted by one of the wind technicians. Once the cranes were spotted, about three dozen wind towers were immediately shut down. For almost the entire month of April, there were cranes in the area. It was a combination of some leaving, some arriving and some remaining. As the birds moved around the area, towers were shut down as needed. During the spring and fall whooping crane migration seasons, Basin Electric hires biologists to patrol the Crow Lake wind park, searching for whooping cranes. Tschosik said the Crow Lake wind park boundaries encompass about 35,000 acres, and wind technicians also are on the lookout for cranes. The whooping crane spring migration season begins April 1 and continues through May 15. The fall season begins Sept. 10 and continues through Oct. 31. He said all of the wind technicians at all of Basin Electric’s wind parks participate in annual training to spot and identify whooping cranes. 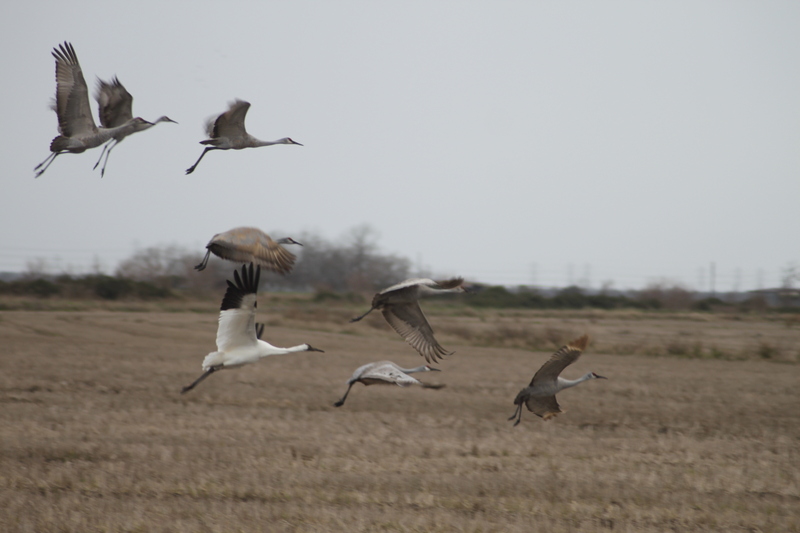 While the cranes were in the area, the biologists carefully watched and charted their movements from afar taking exceptional care to not spook or harass them, Tschosik said. In addition, regular updates were provided to the U.S. Fish and Wildlife Service to keep them informed of the ongoing bird observations and tower shutdowns. Whooping cranes are one of the rarest birds in the world with a total population of approximately 600 individuals, with less than 300 in the migratory flock that travels through South Dakota. After being pushed to the brink of extinction by unregulated hunting and loss of habitat to just 21 wild and two captive whooping cranes by 1941, conservation efforts have led to a limited recovery. As of 2011, there are an estimated 437 birds in the wild and more than 165 in captivity. The whooping cranes that travel through South Dakota migrate from wintering grounds along the gulf coast of Texas to the Wood Buffalo National Park located in Alberta and the Northwest Territories of Canada. Wood Buffalo National Park’s flock of whooping cranes is headed home to the Northwest Territories. Whooping crane with sandhill cranes. The Whooping Crane Conservation Association (WCCA)reported last week that approximately 50 to 60 per cent of the cranes had already left their wintering grounds on the Texas coast in the Aransas National Wildlife Refuge. On Thursday, WCCA’s Chester McConnell said he received word of the first whooping crane sighting of the year in Canada from an observer in Radisson, Sask. The birds undertake the 2,500 mile migration each year to nest and rear their young in Wood Buffalo. US Whooping Crane Recovery Coordinator Wade Harrell monitors the flock in Aransas and reported to McConnell that despite some cranes still being observed on the refuge, the migration is well underway. While the birds seem to be leaving en masse, they actually have staggered departures and leave in small groups, Harrell related. Bird watchers can log their crane sightings at https://whoopingcrane.com/report-a-sighting/ . To see a map illustrating the cranes’ 2013 migratory progress, visit https://whoopingcrane.com/migration/ where observations have been posted since mid March. This map cannot be used to locate the birds as all postings are delayed by at least one week to help prevent harassment of the birds. Canada is home to the world’s largest migratory population of whooping cranes. According to Environment Canada, there are almost 300 birds in the migratory Wood Buffalo flock. Whooping cranes were designated as endangered in Canada in the year 2000. The birds are protected by the Migratory Bird Treaty Act and the Endangered Species Act.